The Park Project is a newly commissioned visual art event taking place in the Moylurg Tower at Lough Key Forest & Activity Park, Boyle on Saturday 26th January at 7pm. Designed by artist Lucy McKenna, this promises to be a spectacular event not to be missed. There are a very limited number of spaces available for members of the public to view the display from the tower, please follow the link to book a space via eventbrite. The following were declared company executive officers: Chair, Frank Geelan; Joint Treasurers, Dara Callaghan and Terry Rooney; PRO, Padraig Langan. The positions Secretary and Members of Committee will be decided following the Company’s next meeting tentatively arranged for Thursday 25th January. A thorough Open Discussion highlighted the exciting future ahead for the building and its Model Railway project with references to the fund raising requirements and employment possibilities of the venue that will add to the tourism and attractions available in the Boyle area. Short Mat Bowling continues in St. Josephs Hall each Wednesday from 7pm until 9pm. Newcomers most welcome. Tuition given to new members. FREE Composting and Recycling Event, Ardcarne Garden Centre Boyle and Roscommon Town, Saturday 26th January from 11.30am until 12.30 pm. Discover how to transform garden and kitchen waste into nutrient-rich compost for your plants and other ways to re-use and recycle in the garden. Free Event – All Welcome. Race takes place Sunday 1st September – Entries Open 9am 1st February on the Triathlon Ireland website!! Entries will be limited to 500 competitors and as one of the final rounds of the BMW National Series we are expecting a sell-out entry like previous years! Bookings are now being taken for the Spring Health and Wellbeing Craft Fair that will take place in Boyle on Sunday March 10th, The Fair will take place in the Spool Factory Event Centre from 12 noon to 6pm. The event will feature complementary therapists, crafters, soap makers, crystals etc. For more details, contact Lucy on 0896014843. Some stalls are already booked and places are limited. Boyle Athletic Club training continues from the Royal car park at 7. 30pm.The training run lasts one hour. Training Schedule: Tuesday 7.30pm to 8.30pm (From Royal car park) Thursday 7.30pm to 8.30pm (From Royal car park) Sunday 10am (From Lough Key Forest Park) Please bring a headlamp and hi vis to training if you have one. The run departs at 7:30pm sharp so please arrive 7:15/20pm for pre run brief. Training is for members only, of which there are currently over 100. 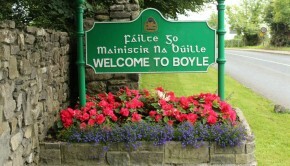 Boyle GAA to host ‘I’m a Celebrity’ Excitement is building ahead of next year’s Boyle GAA organised ‘I’m A Celebrity Get Me Out of Here’ fundraiser. The event will take place on Saturday March 16th in St. Joseph’s Hall. 24 contestants will battle it out to see who is the ‘King or Queen of the Jungle’. The main sponsor of the night is LandEscape Pty Ltd, the Australian company run by Boyle man Padraig Sweeney. Based on the popular TV show, this event is unlike anything you have seen before! Contestants are fully dressed in their campsite costumes and compete alongside live snakes, reptiles and spiders surrounded by a jungle background.